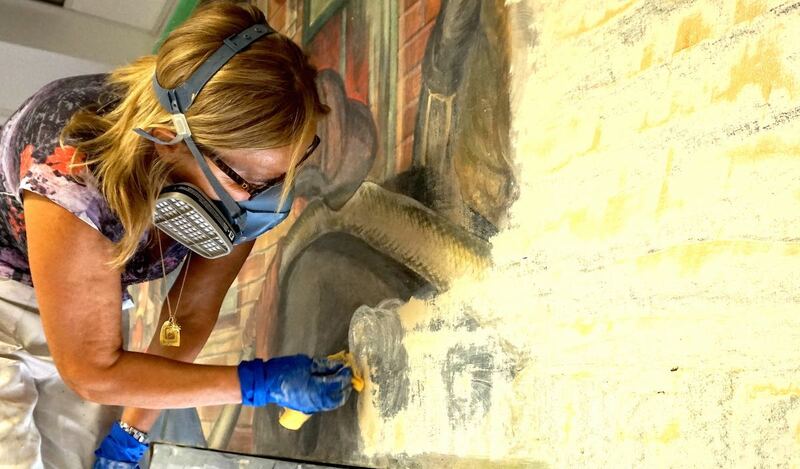 I am often asked about the process of and the price for removing overpaint from off of historic murals. Its a mural restoration process I’ve been acquainted with since 1975 while working in Italy (click here for background info). General contractors, architects, historic preservation planners and city project planners will be completely unfamiliar with the art conservation processes presented in this video and perhaps will be unfamiliar working with the professional services field of mural conservation. Discover some of the important details when considering the removal of paint from off of murals. This short video shows different examples of mural conditions and mural restoration treatments. Get your pen ready, there is lots of good project planning information you can count on in this video. Anna Frassine, Italian Mural Conservator removes the last layer of paint.